Victims caught in terrorist atrocities perpetrated for Islam typically experience fear, torture, horror, and murder, with sirens screaming, snipers positioning, and carnage in the streets. That was the case recently in Bombay (now called Mumbai), where some 195 people were murdered and 300 injured. But for the real target of Islamist terror, the world at large, the experience has become numbed, with apologetics and justification muting repulsion and shock. 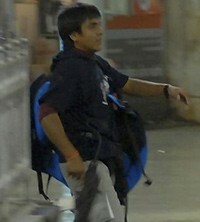 The one Mumbai terrorist still alive, Ajmal Amir Kasab, in action. If terrorism ranks among the cruelest and most inhumane forms of warfare, excruciating in its small-bore viciousness and intentional pain, Islamist terrorism has also become well-rehearsed political theater. Actors fulfill their scripted roles, then shuffle, soon forgotten, off the stage. Indeed, as one reflects on the most publicized episodes of Islamist terror against Westerners since 9/11 – the attack on Australians in Bali, on Spaniards in Madrid, on Russians in Beslan, on Britons in London – a twofold pattern emerges: Muslim exultation and Western denial. The same tragedy replays itself, with only names changed. Muslim exultation: The Mumbai assault inspired occasional condemnations, hushed official regrets, and cornucopias of unofficial enthusiasm. As the Israel Intelligence Heritage & Commemoration Center notes, the Iranian and Syrian governments exploited the event "to assail the United States, Israel and the Zionist movement, and to represent them as responsible for terrorism in India and the world in general." Al-Jazeera's website overflowed with comments such as "Allah, grant victory to Muslims. Allah, grant victory to jihad" and "The killing of a Jewish rabbi and his wife in the Jewish center in Mumbai is heartwarming news." Such supremacism and bigotry can no longer surprise, given the well-documented, world-wide acceptance of terror among many Muslims. For example, the Pew Research Center for the People & the Press conducted an attitudinal survey in spring 2006, "The Great Divide: How Westerners and Muslims View Each Other." Its polls of about one thousand persons in each of ten Muslim populations found a perilously high proportion of Muslims who, on occasion, justify suicide bombing: 13 percent in Germany, 22 percent in Pakistan, 26 percent in Turkey, and 69 percent in Nigeria. A frightening portion also declared some degree of confidence in Osama bin Laden: 8 percent in Turkey, 48 percent in Pakistan, 68 percent in Egypt, and 72 percent in Nigeria. As I concluded in a 2006 review of the Pew survey, "These appalling numbers suggest that terrorism by Muslims has deep roots and will remain a danger for years to come." Obvious conclusion, no? Western denial: No. The fact that terrorist fish are swimming in a hospitable Muslim sea nearly disappears amidst Western political, journalistic, and academic bleatings. Call it political correctness, multiculturalism, or self-loathing; whatever the name, this mentality produces delusion and dithering. Nomenclature lays bare this denial. When a sole jihadist strikes, politicians, law enforcement, and media join forces to deny even the fact of terrorism; and when all must concede the terrorist nature of an attack, as in Mumbai, a pedantic establishment twists itself into knots to avoid blaming terrorists. I documented this avoidance by listing the twenty (!) euphemisms the press unearthed to describe Islamists who attacked a school in Beslan in 2004: activists, assailants, attackers, bombers, captors, commandos, criminals, extremists, fighters, group, guerrillas, gunmen, hostage-takers, insurgents, kidnappers, militants, perpetrators, radicals, rebels, and separatists – anything but terrorists. And if terrorist is impolite, adjectives such as Islamist, Islamic, and Muslim become unmentionable. My blog titled "Not Calling Islamism the Enemy" provides copious examples of this avoidance, along with its motives. In short, those who would replace War on Terror with A Global Struggle for Security and Progress imagine this linguistic gambit will win over Muslim hearts and minds. Post-Mumbai, analysts such as Steven Emerson, Don Feder, Lela Gilbert, Caroline Glick, Tom Gross, William Kristol, Dorothy Rabinowitz, and Mark Steyn again noted various aspects of this futile linguistic behavior, with Emerson bitterly concluding that "After more than 7 years since 9/11, we can now issue a verdict: Islamic terrorists have won our hearts and minds." What finally will rouse Westerners from their stupor, to name the enemy and fight the war to victory? Only one thing seems likely: massive deaths, say 100,000 casualties in a single WMD attack. Short of that, it appears, much of the West, contently deploying defensive measures against fancifully-described "activists," will gently slumber on. Related Topics: Media, South Asia, Terrorism | Daniel Pipes receive the latest by email: subscribe to the free mef mailing list This text may be reposted or forwarded so long as it is presented as an integral whole with complete and accurate information provided about its author, date, place of publication, and original URL.